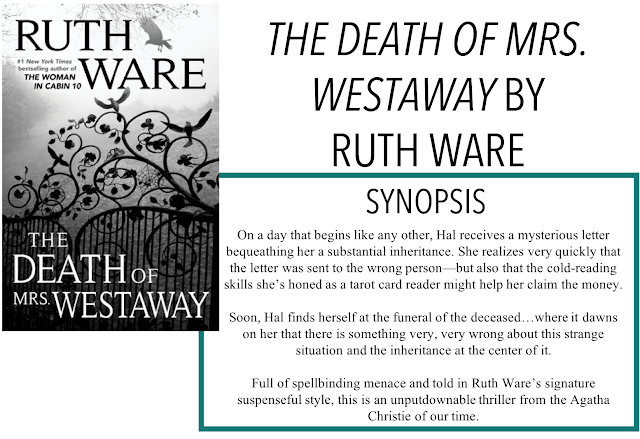 Generally speaking, I've been a pretty big fan of Ruth Ware's books in the past, so I had pretty high expectations for this book. I really enjoyed it and think it might just be my second favourite, just after The Woman in Cabin 10. I am back with another review, The Death of Mrs. Westaway by Ruth Ware. Thanks so much to Simon and Schuster Canada for sending me a copy of this book for an honest review, as always, all opinions are my own. The story follows 21-year-old Hal. Three years ago, her mother in a car accident and ever since Hal has been struggling to pay the bills and keep some food on the table. Just when a local loan shark starts sniffing around for the money Hal borrowed from him, she gets a letter from the solicitor of her recently deceased grandmother, claiming that she has a substantial inheritance waiting for her, along with a family she never knew existed. But Hal knows the letter must have been sent to her by mistake - her grandmother has been dead for years, and she never knew her father's family. Still, the promise of money is too much for her to pass up and she travels to the large estate. She soon finds herself wrapped up in family drama - some of which may just prove deadly. Initially, this book took a bit to get in to. I knew eventually it would pick up, so I stuck with it, but I just felt like some of the beginning chapters could have been shorter or cut out altogether. Once Hal makes it to the estate, however, the story really picks up. I don't want to spoil anything so I won't say too much about the plot but I will say that it really hooked me in once it started going. Ware has consistently been great at setting up a thriller, perfectly paced with just enough details to send you chasing after a million different red herrings. I will say that in the case of this book, I was puzzled until the very end. For instance, I guessed who Hal's father was fairly early on, but it didn't seem to make sense, so I disregarded the notion. When everything was finally revealed, it made sense, but it took me a minute to figure out all the smaller details and repercussions that resulted from what had happened. This book was largely plot based so I don't feel like I had a major attachment to most of the characters but some of the vivid descriptions Ware gives helped me sympathize with some of them, especially from the diary entries. If you're looking for a thriller that is character based, I don't know if you will love this one, mainly just because I don't think there is a lot of growth and change for the characters from beginning to end of this one. I also absolutely love how Ware beautifully wove the tarot card reader aspect of Hal's life into the story, including readings and multiple explanations of the various cards. It's something that I'm both equal parts skeptical of and fascinated by and I really loved the addition of this element to the book. Overall, I think this is one of Ware's better books and highly recommend it!